Congratulations, email marketer! You’re a spam artist. You may not see yourself that way, and you may not want to brand yourself as such, but the truth is that every email we send, every drip campaign we painstakingly organize, every A/B test we fire off—they’re all getting lumped together with Viagra ads and Nigerian-prince scams. Each email client operates differently, but the fact is that Gmail can tell when you’re sending a massive swath of emails out to thousands of people, and that’s an inherently suspicious action. Even when you have double-opt-in consent to email the person, they may never see your email. It’s our job, as intelligent people, to elevate our work above the blah. We should hold ourselves to greater standards and ensure our work floats above the sea of meaningless gibberish to which most email clients seem to think we belong. But, of course, there’s good news: we can achieve this dream. There are ways to keep your emails out of spam folders across the web. Here are seven of them. The first email from your drip campaign should probably include some whitelisting language. Whitelisting, essentially, is the act of labeling an email address as “safe,” to ensure it goes straight to your inbox and avoids the spam folder. Different email clients have different ways of achieving this, but offering some kind of instructional advice is a good start. Even if only a few people actually comply, that’s a few more who wouldn’t have otherwise, and you’ll see better engagement and open rates as a result. One of our top email tips—one that we still see disappointingly few people realizing—is to change your “from” address to a real name. Instead of using a generic email (e.g. noreply@hatchbuck.com), try using your real name—“Jess from Hatchbuck”—to create a sense of personality and trust. After all, you’re asking for trust from them by using their email address, so it’s fair to give some back. Sending emails whenever it’s convenient? Good luck with that. Email marketing is far more effective when you stick to a schedule—if you’re dishing out a weekly newsletter, people will look forward to receiving it on regular days. This also helps fosters loyalty and brand recognition. If you’re managing a drip campaign, think about how much time people will want to spend between emails—fire them off too quickly, and people will get annoyed; fire them off too slowly, and they’ll forget the first one. One of the ways spam filters determine which emails to tuck away is by analyzing the content of the email itself. You should avoid huge file sizes, attachments, spammy backlinks and misleading phishing phrases entirely. 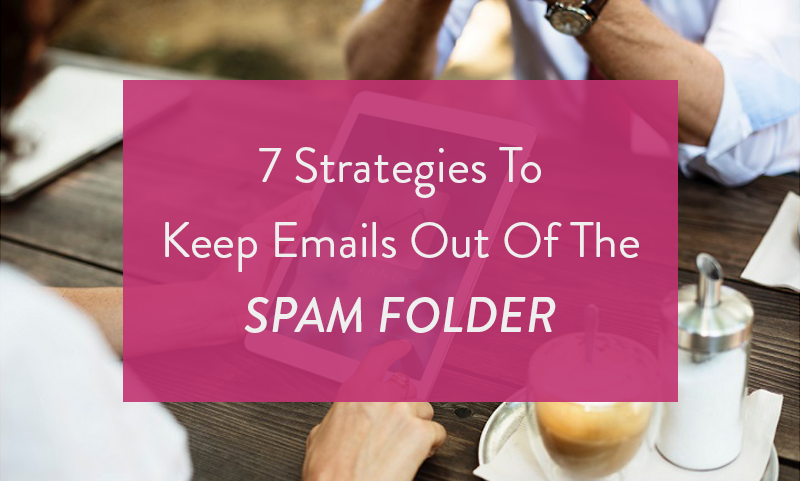 The less your emails resemble actual spam, the better your odds are at avoiding the spam box. You never know who’s reading your emails—so make sure you comply with all major email requirements. CAN-SPAM has been the main protector against spam in the United States since 2003, but other countries have taken things a step further. Canada’s recent CASL law requires express consent, usually in the form of a double opt-in agreement, in order to email people. Europe and Australia have similar laws. Even if you don’t think you’ll be penalized for breaking Canadian law, they’re good laws that look out for the safety and comfort of end users—and that’s who you should be caring about, too. Image-only emails are generally considered a marketing faux pas. There are a few reasons why. From a design standpoint, text written into images doesn’t appear as legibly on all devices as actual text; from a marketing standpoint, email clients can’t identify what’s in images, so are more likely to mark them as spam; from a UX standpoint, users who can’t view images in their inbox can’t see your message at all. Using alt text is a good start, but balancing words and pictures is even better. A quality ESP will have your back—they can help ensure you’re compliant, make designing emails easy with drag-and-drop tools, allow for simple split testing and let you keep in touch with your fans automatically with drip emails and segmented lists. And, hey, if you’re in the market for an ESP, we can recommend a pretty good one.